A video camera on the exterior of the International Space Station captured this image of space shuttle Endeavour a little less than an hour after the two spacecraft undocked at 11:55 p.m. ET May 29, 2011 during the STS-134 mission. On the eve of the space shuttle Endeavour's last landing, its six-astronaut crew paid tribute to the storied orbiter's 19-year career. Commander Mark Kelly is set to guide Endeavour back to Earth early Wednesday to cap a 16-day mission to deliver an ambitious $2 billion astrophysics experiment to the International Space Station. After Endeavour's final landing, NASA will fly only one more space shuttle mission — aboard the Atlantis orbiter — before retiring its reusable space plane fleet for good. "The retirement of Endeavour and the shuttle fleet will not end the human need to explore," Kelly said during a tribute event to the orbiter today (May 31). "It is and always will be part of who we are." Endeavour actually has two chances to land in Florida early tomorrow depending on weather conditions, which are expected to be favorable for both. The second landing option occurs at 4:11 a.m. EDT (0811 GMT). The six member crew for space shuttle Endeavour's final mission poses for an STS-134 in-flight crew portrait in the Japan Aerospace Exploration Agency's Kibo lab on the International Space Station on May 26, 2011. Some astronauts shared stories of their personal connection to Endeavour, the youngest of NASA's three orbiters. "I'll never forget the moment when Endeavour pulled into formation right below the space station," Chamitoff recalled. "It was just a beautiful sight. So it is a little bit hard to see a spaceship like this being retired." Endeavour was built to replace the space shuttle Challenger, after that orbiter was destroyed, along with its crew, in the 1986 accident. It launched on its first flight in May 1992. "Endeavour was always my favorite, I think because it was the newest of the orbiters, it smelled a lot more like a new car than some of the more seasoned of the orbiters," said pilot Greg H. Johnson. Johnson said Endeavour's legacy would be its contributing to assembling the football-field size International Space Station. 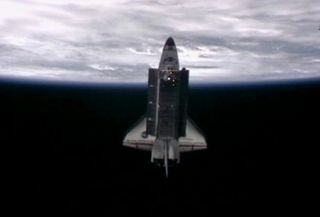 The orbiter carried the first U.S. segment of the station, the Unity module, in December 1998. On this STS-134 mission, Endeavour left a sensor-tipped pole, or boom, on the space station that will be the last planned addition of new U.S. hardware to the orbiting laboratory. The space station is now considered fully assembled. Endeavour "had the unique distinction of bringing up the first piece of the space station and also… Endeavour brought up the last piece of the space station as well," Johnson said. "She was a very important part of the assembly of the space station from beginning to end." Chamitoff said he would be contemplating that legacy as the orbiter glided to a final landing tomorrow. "Space station is our new foothold in the future and that's a big legacy that Endeavour has," Chamitoff said. "This is what I will think about as we come to land Endeavour tomorrow." Endeavour will be sent to retire at the California Science Center in Los Angeles, while its sister orbiters will be similarly dispatched to museums. For its next phase, NASA will work on building spaceships to take people to an asteroid and on to Mars. "It's bittersweet to know that it's coming to an end and we all have varying futures ahead of us, but it will be interesting to see what that brings for all of us," mission specialist Drew Feustel said.